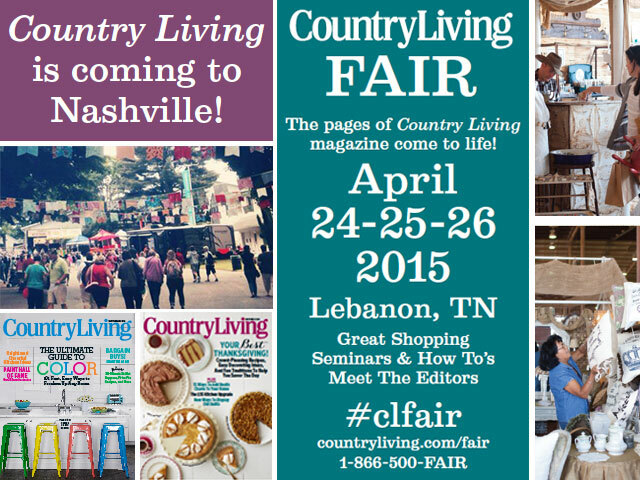 I’m almost all set up for The Country Living Magazine Show this weekend in Lebanon, TN! I picked up my trusty travel partner on the way down, AKA Show Dad. It’s fun to spend some quality time with my dad, have help at the show, and it really helps when traveling and doing a big show to have someone who pretty much has your same sense of humor. We got down here earlier than my usual show rush and it feels pretty awesome to have a break and be a little bit more relaxed than the usual rush! Here’s a sneak peek of my booth! Come see me for artgoodies: NEW 16×16 pillows making their public debut! zippered pouches, towels, stuffies, and full aprons. 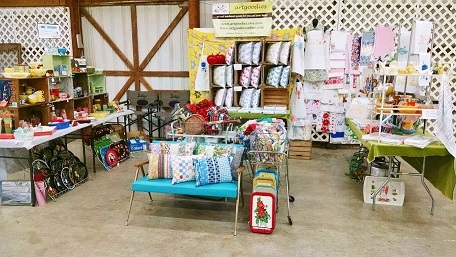 AND of course, vintage: tablecloths, trays, housewares, planters, handmade pillows, scrap packs, and other odds and ends! See me early for the best selection and a couple early bird specials! I’ve been off the road for almost 3 years now staying busy with my growing and changing business, plus a couple house photo shoots etc. It’s time for me to hit the road again doing some select shows. 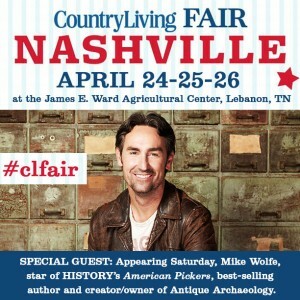 Join me in Lebanon, TN just outside of Nashville for The Country Living Magazine Fair April 24-26! Follow me here on instagram as I pack it up and move it out! This’ll give you a little sneak peek into my booth and what I’m bringing! My booth will be a colorful explosion of artgoodies and vintagegoodies! Really it will be your textile HQ with artgoodies towels, pillows, zippered pouches, aprons. PLUS vintage pillows I whipped up, tons of vintage tablecloths (I lost count, 70 plus at this point). Vintage housewares galore including Pyrex, trays, and a few other of your favorite surprises. 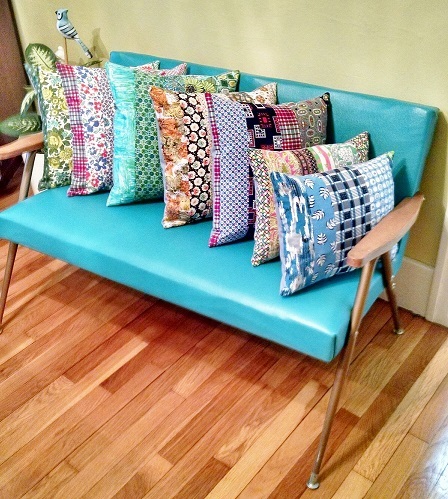 Here’s a little mid century loveseat I recovered for my new vintage fabric pillows! I used remnants from my artgoodies pillows and aprons to create these one of a kind beauties! Color of the Month April 2015! April showers bring May flowers! Spring! My favorite time of year as plants start to emerge, rummage sales fire up, the cottage opens back up, and the weather starts to warm! Plus April means a flurry of birthdays and my parents anniversary so there are extra things to celebrate! 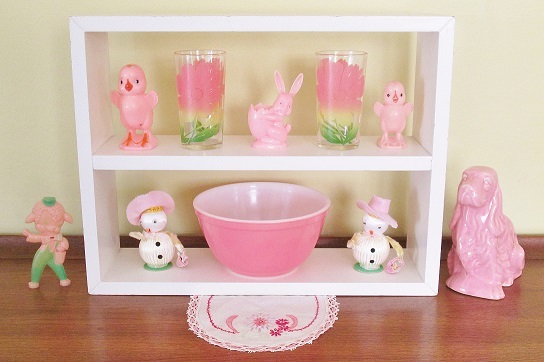 Fave vintage items: kitschy vintage Easter- chicks, bunny, and lamb lollipop holder, Pyrex bowl, flower glasses, and little doily, plus the Shawnee dog planter! 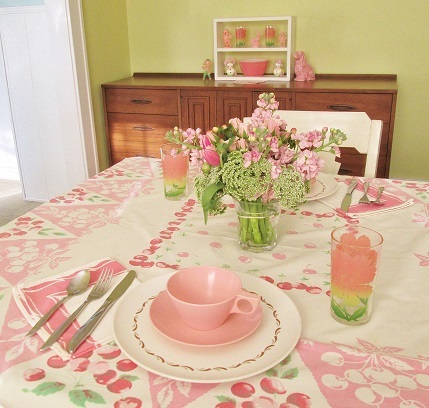 Fave vintage items: cherry tablecloth, melmac, flower glasses, napkins, and NEW this month color of the month floral centerpiece! PINK!